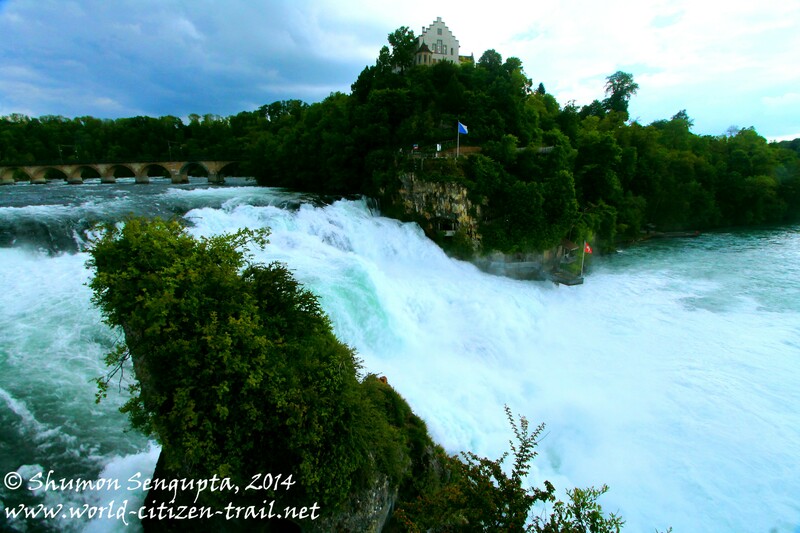 The Rhine Falls is 450 feet wide and 75 feet tall and is the largest and considered by many as the most spectacular waterfalls in Europe. 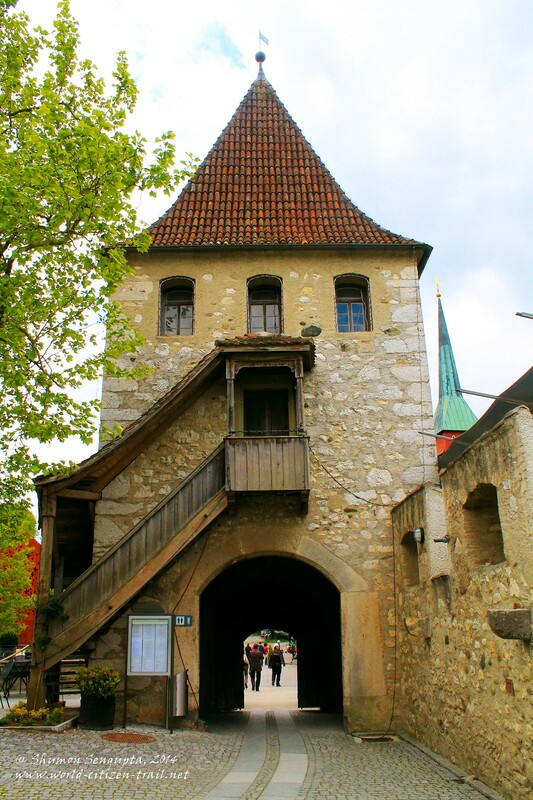 Located on the High Rhine, the best way to reach this place is from the historic town of Schaffhausen in Northern Switzerland. 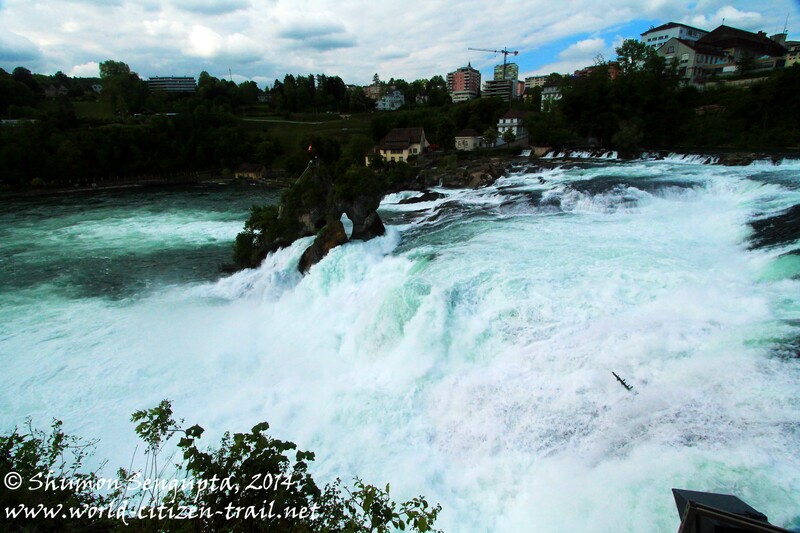 Southwest from Schaffhausen, the picturesque Rhine River takes a sinuous, winding course amidst dense forests and mountains and about 5kms downstream, it transforms itself into the magnificent Rhine Falls, cascading violently in three leaps over a rocky ledge. A couple of protruding cocky outcrops emerges from the middle of the wide waterfalls, dividing the falls into two sections. 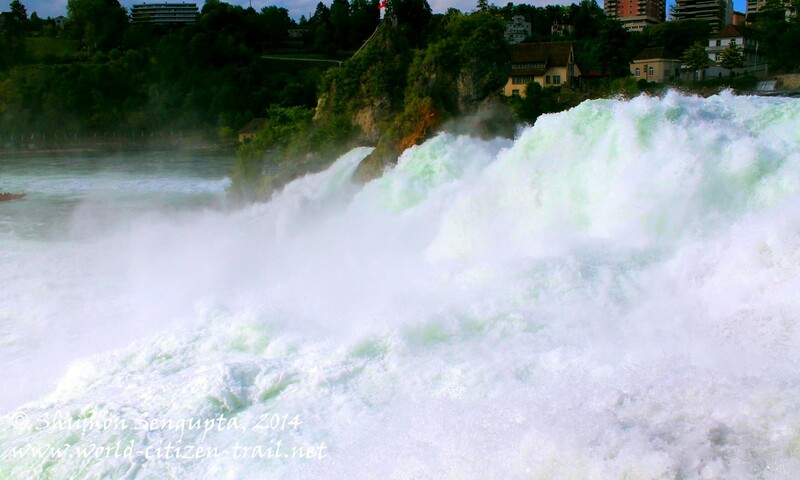 The falls are best visited in early summer, when melting shows from the far away mountains create a massive swell and surge of water. 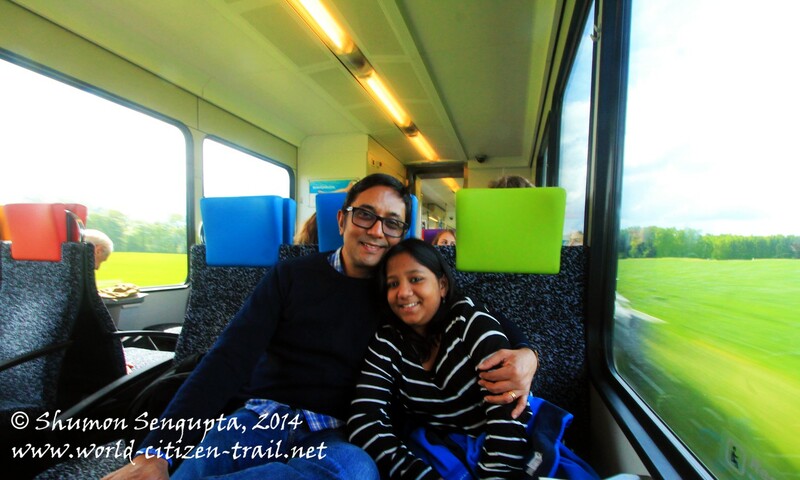 From Zurich, it took us 40 minutes by the direct train to Schaffhausen. 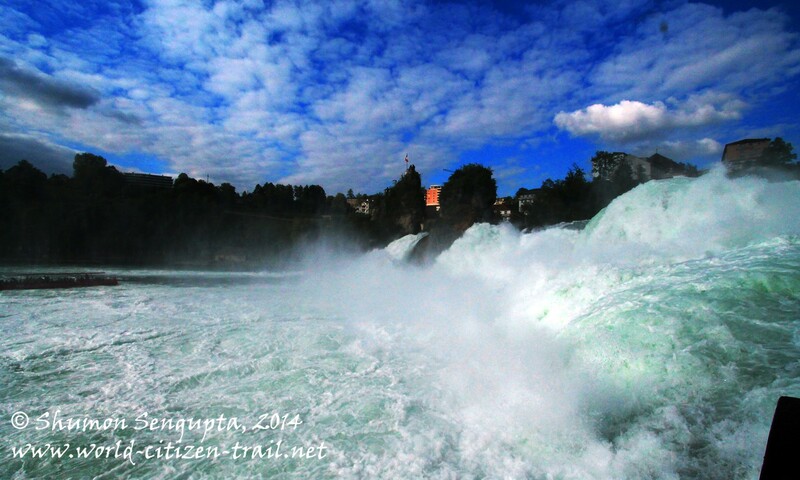 Since we had planned to stay the night near the falls, we left bigger luggage at the locker in Zurich HB station and took with us our backpacks. 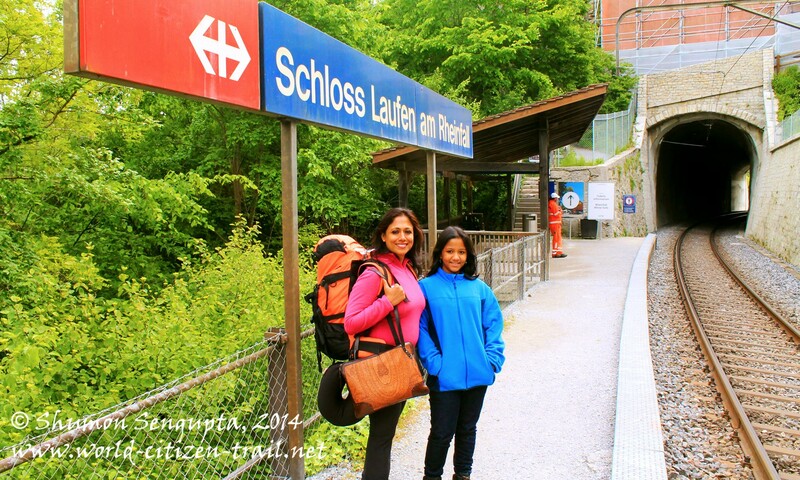 We were travelling in Switzerland for 24 days and hence weren’t traveling light. 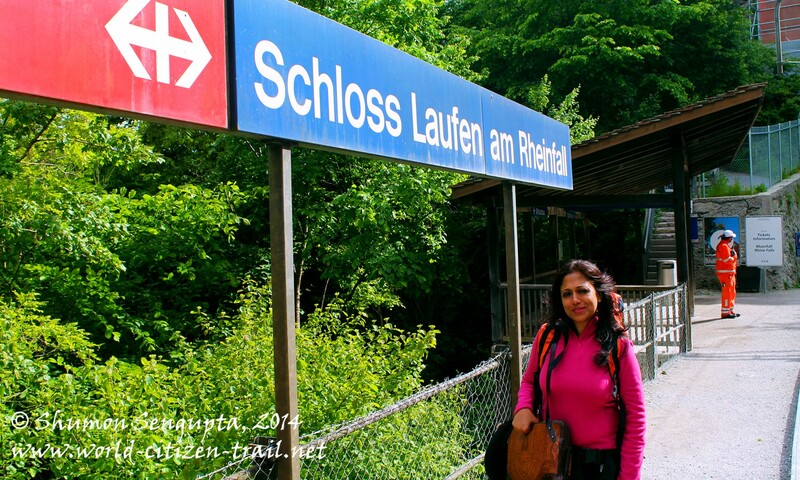 From Schaffhausen, our plan was to take the city train that passes above the Rhine Falls, into the tiny little railway station of Schloss Laufen am Rhinefall, located below the 1,000 year old castle of Laufen. 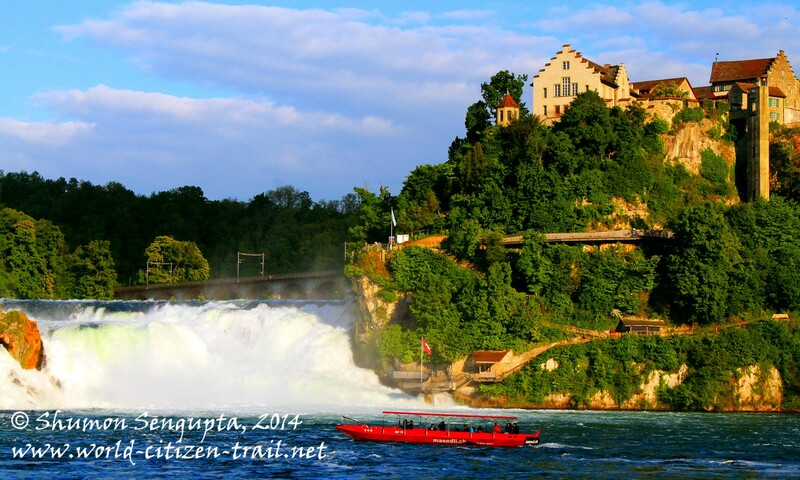 The station is right next to the falls, on the southern side of the Rhine. Unfortunately, things did not go as planned. 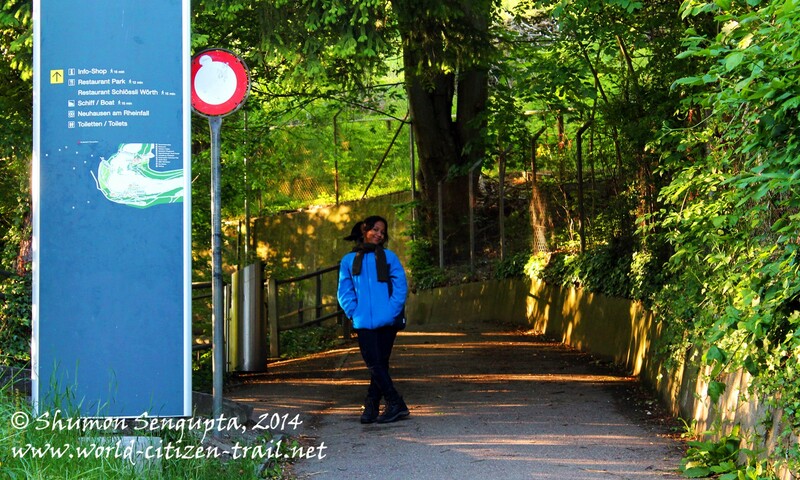 After getting out of the station in Schaffhausen, I forgot that we were supposed to take the city train. 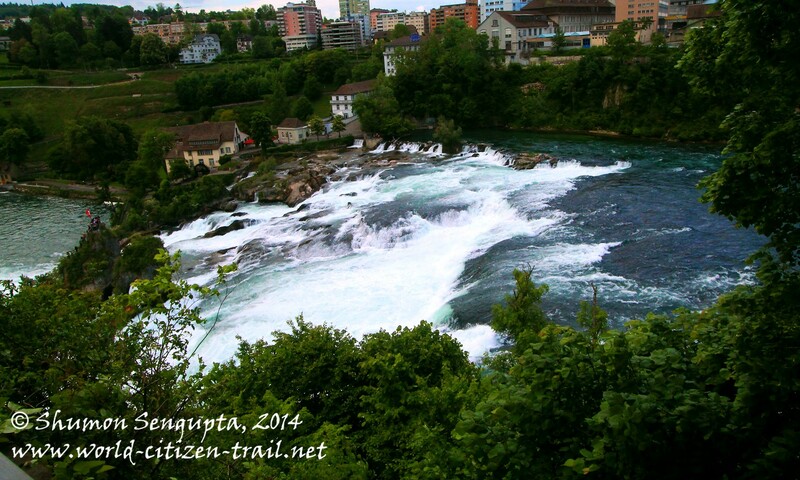 We took the city bus instead, which took us to Neuhausen, the small town located on the northern (and further side) of the Rhine Falls. 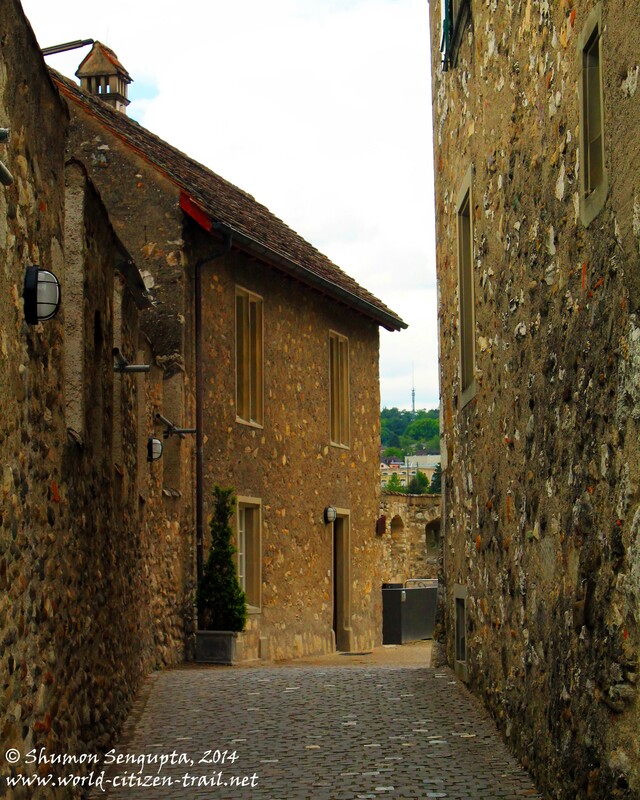 Feeling perfectly lost, I politely asked an elderly couple – the only souls other than us in the deserted place – how we could get to Schloss Laufen. We knew no German and the elderly couple hardly knew any English. The gentleman said: “Ah! You know English.. then no problem!” and then he started off in German, trying to explain to us the way to Schloss Laufen. 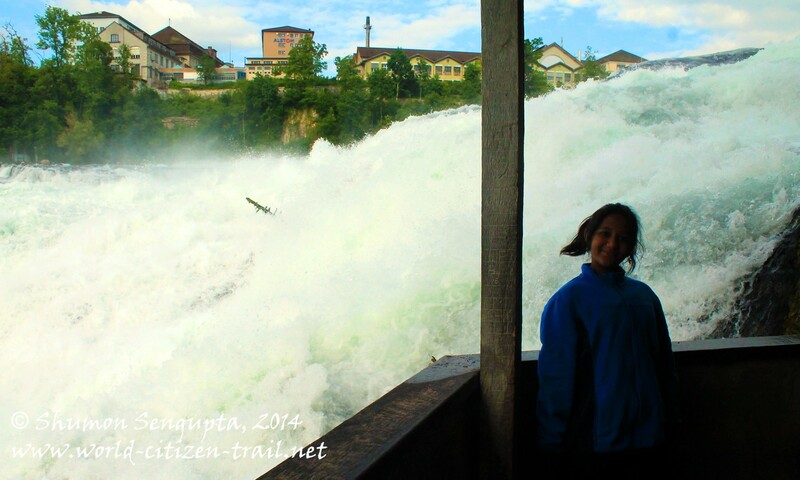 Seeing our puzzled faces, the incredibly charming lady, probably into her 80s, butted in and eagerly explained to us by animated action, supported by the gesticulations of her equally elderly, enthusiastic and helpful companion, that we were on the northern (and wrong) side and needed to head in the direction of Rhine Falls Park by the river bank, walk through a patch of forest, cross the long railway bridge over the river above the waterfalls, get to the opposite bank on the southern side and then climb up to the top of the hill to reach Laufen castle! I could sense Nina getting really anxious, but our 11 year old daughter Minnie and I were always up for an adventure. 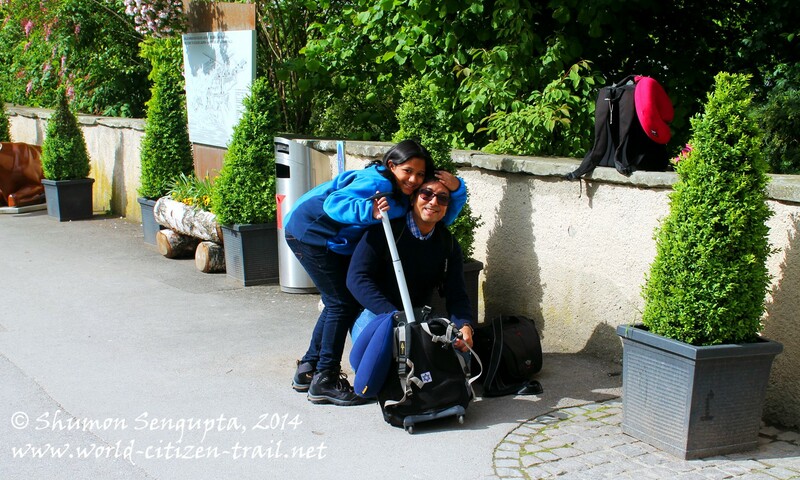 At the same time, we did have two backpacks and a trolley bag, with my laptop to carry. On top of that, I had my bulky camera (with four lenses) to reckon with. Before Nina could take off on her tirade about the mess we were into, hastily thanking the elderly couple and saying goodbye, I strapped on the heavier backpack, slung my camera bag across my shoulder, picked up my heavy laptop bag on one hand and started walking in the direction our dear old lady had indicated. Nina and Minnie took the lighter backpack in turns. 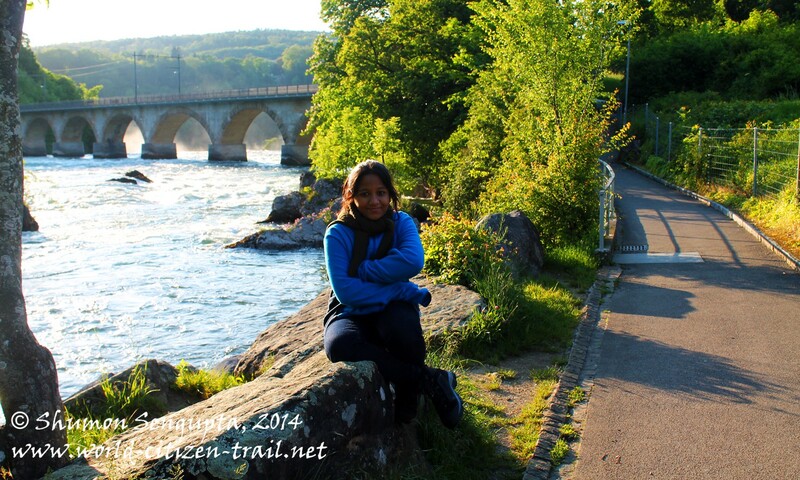 Before long, we were by the side of the Rhine River, walking through some spectacular forest, hill and river landscape. 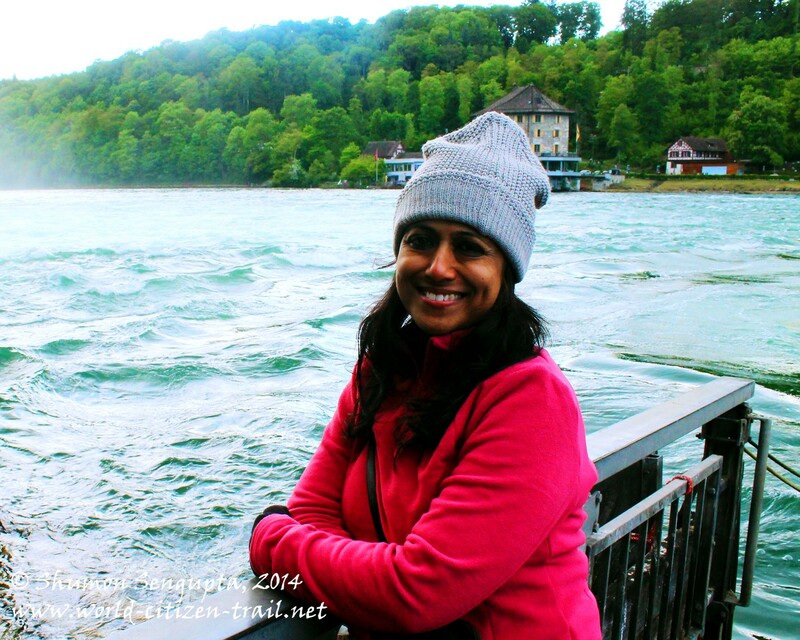 From a distance, I could see the Laufen Castle perched on top of the forested hill on the other side of the river and this left me wishing, despite being in pretty good shape, that I had done some physical endurance training before our 24 day Switzerland trip. And now, I shall let out a small secret. 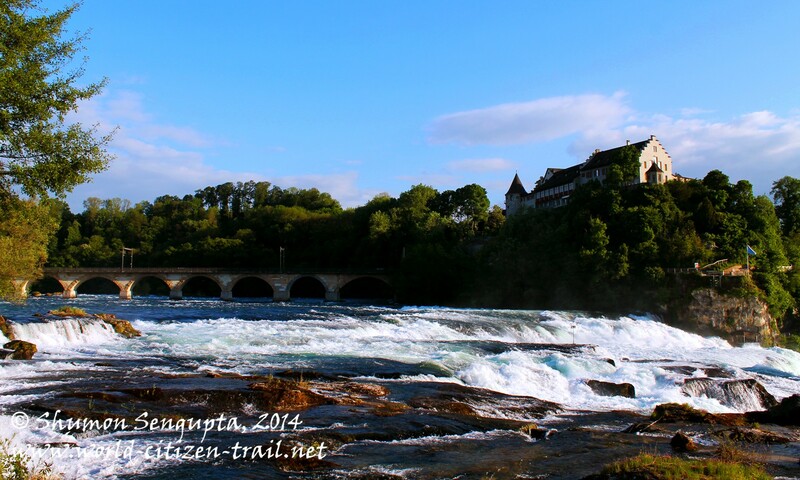 Located right above the thundering Rhine Falls, a part of Schloss Laufen (Laufen Castle) has been converted into a youth hostel (called the Dachsen Youth Hostel). It is the most vantage location, albeit a modest one, to spend a night, if you want to stay closest to the waterfalls and experience them in their full splendor – including in the night when the waterfalls are spectacularly lit up. 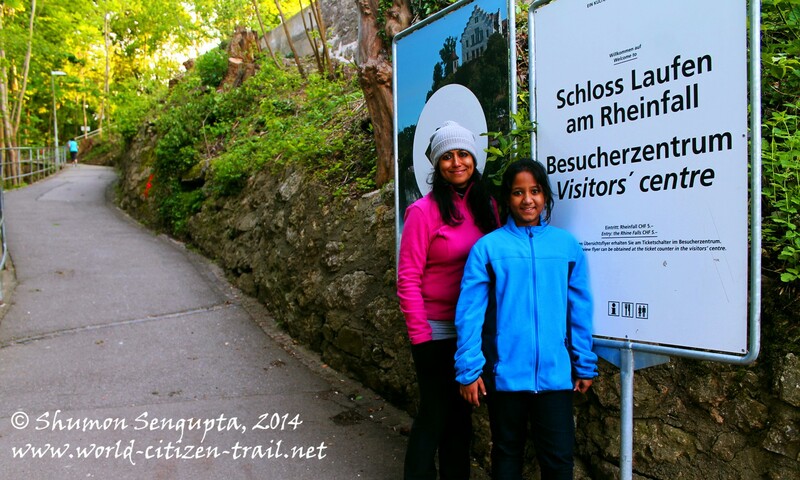 We reached Dachsen Youth Hostel in the Laufen castle in about an hour, exhilarated and pretty much exhausted. It was around 11 in the morning and to our utter surprise, we found that the place was locked. The youth hostel has a lock-out period between 10 am and 5 pm and like us, if you did not check in earlier and collect your key to the main entrance door, you would be left stranded outside, till five in the evening. We decided to have some refreshments in the nearby café – I needed some tea and cakes to collect my wits. I enquired if there was a locker facility somewhere nearby to store our luggage. The friendly young waiter at the café said that there wasn’t any, but we could keep our luggage in a corner of the café, as long as we came back before 6 pm (when the café closed) to collect them. He assured us that he would keep an eye and our luggage would be safe. 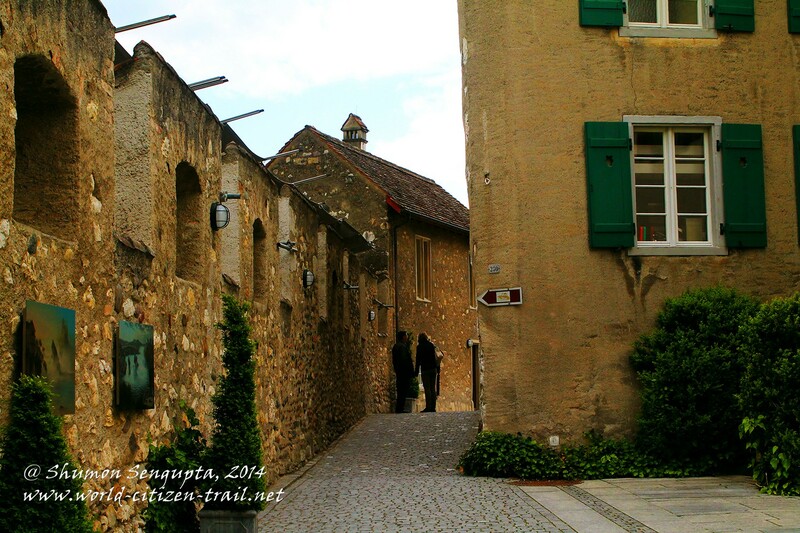 We believed him – it was only in Switzerland that such implicit trust was possible. 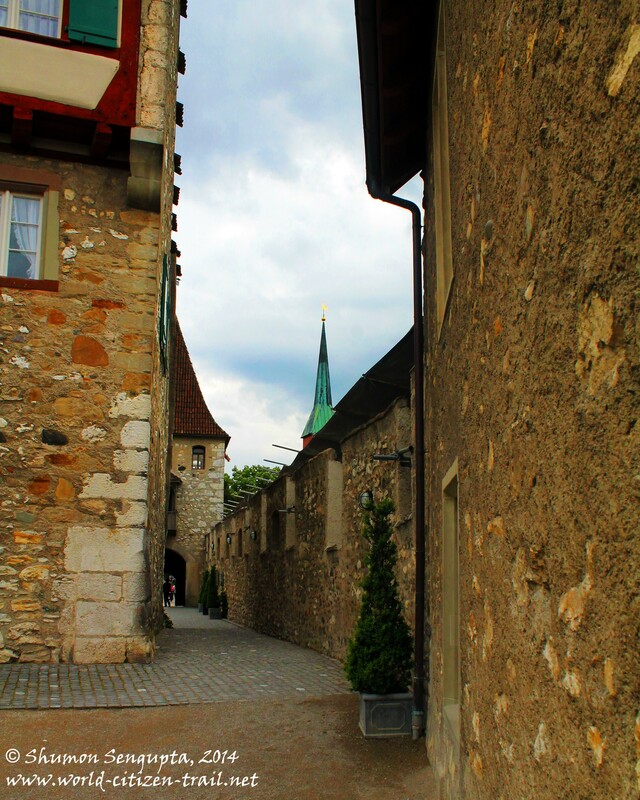 We then headed off to Schaffhausen (covered in another post) by bus, to spend the morning in this beautiful historic town. And when we came back to collect our luggage later in the evening, our kind man at the cafe handed over our luggage and politely dismissed my enquiry about a payment for safekeeping. Again, this was possible only in Switzerland. We thanked him and left with our hearts feeling warm. The Swiss have a reputation for being detached, cold and unfriendly. For us, this stereotype was totally belied from our encounter with the elderly couple earlier in the day, and the young waiter later. Life often has this tendency to present you with the pleasantest surprises, when you least expect them. 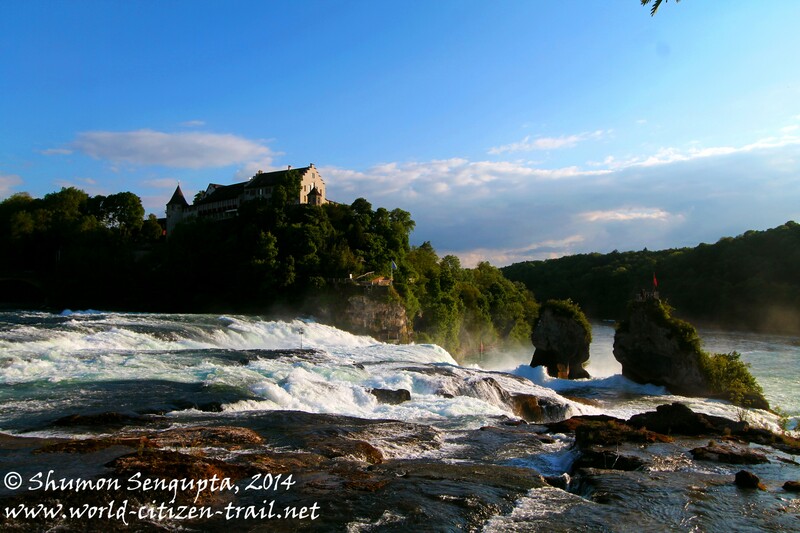 From the Laufen castle, you can access the waterfalls directly from the courtyard via the beautiful Belvedere route. 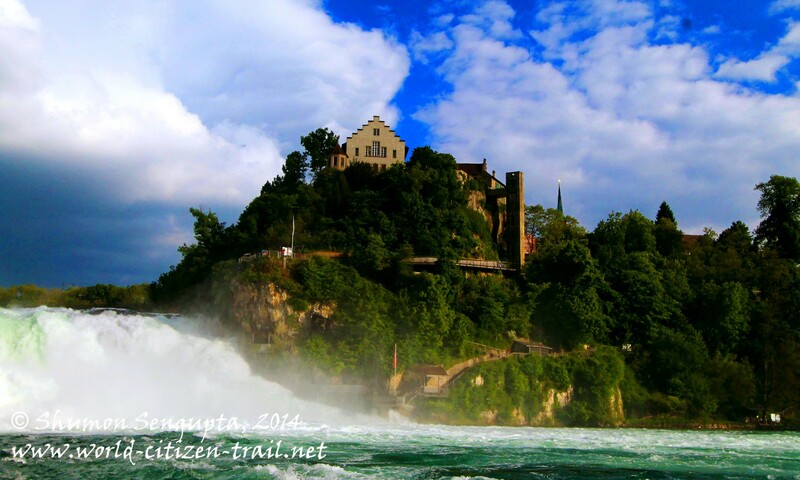 The waterfalls is just below the castle and with its splendid location on top of the cliffs, the Laufen castle along with its Youth Hostel visually lords over the magnificent waterfalls. 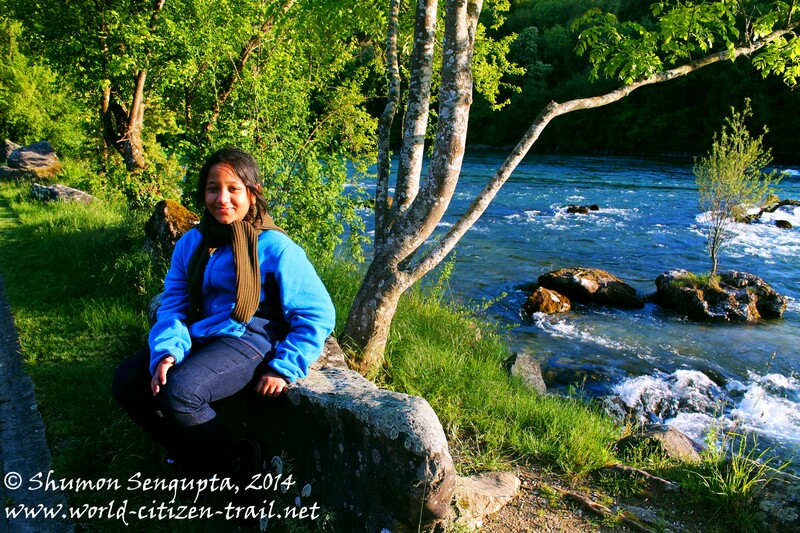 After we checked into our place around 5 pm, we got out, took the Belvedere route downhill along flights of narrow, winding stone paved stairs and found ourselves right next to the roaring waterfalls. 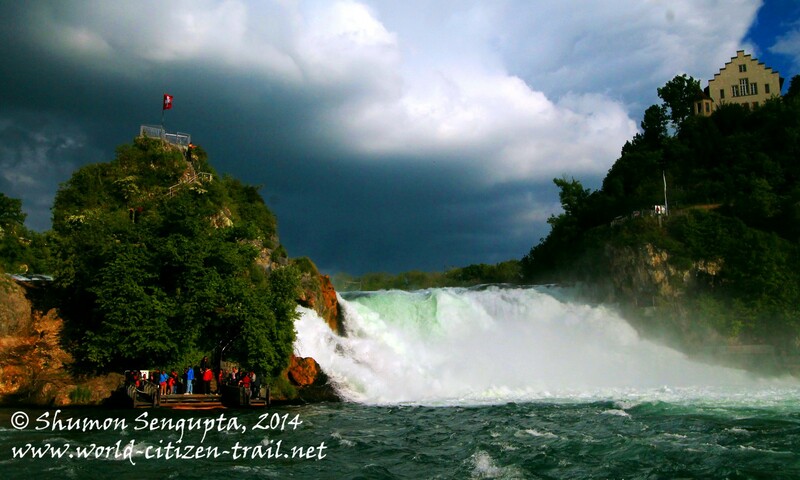 There were various viewing platforms along the way, offering spectacular views of the waterfalls. 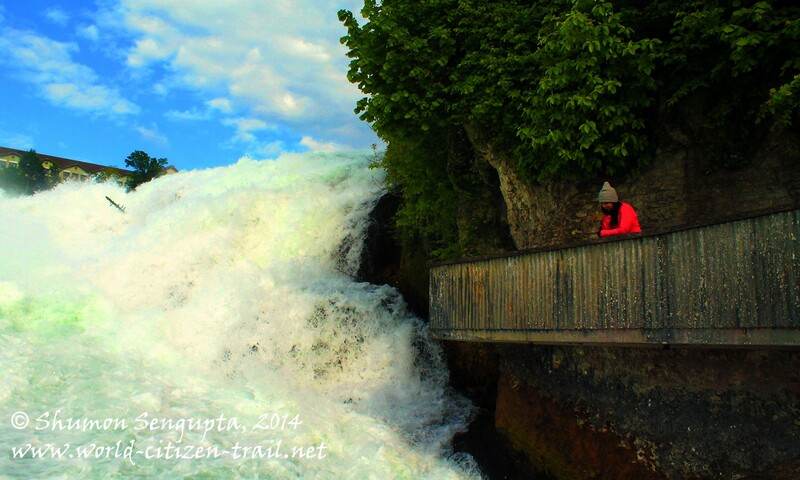 The falls was mind blowing, with violent, roaring waters falling with great force and rushing downstream. 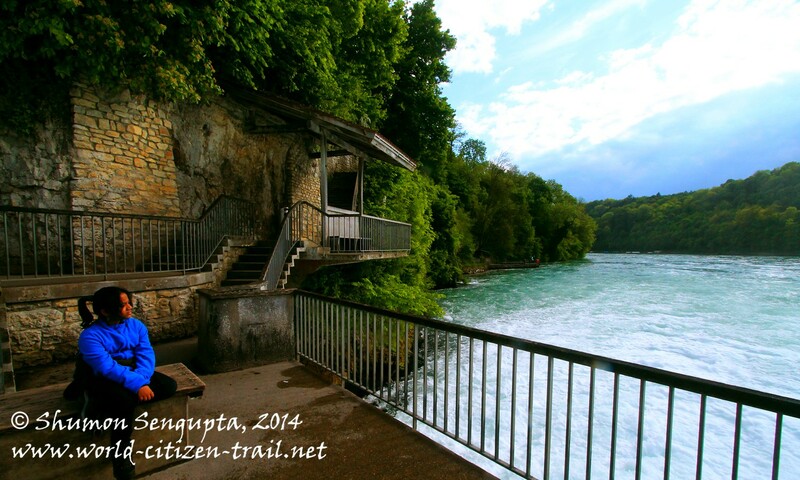 Every viewing platform offered a different and equally marvelous view of the falls. We could feel the vibration of the waterfalls at one of these, built at the very edge of the massive column of violent falling water – so close that it seemed we could touch the waters. Needless to say, we got wet by the spray. 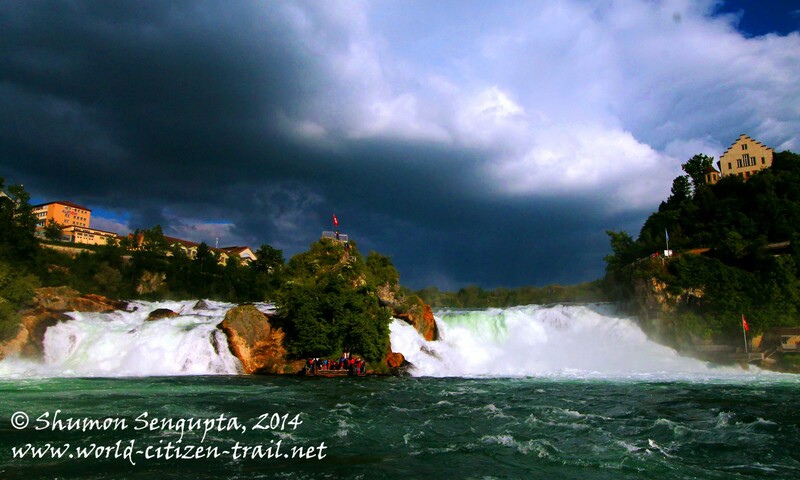 The platform at the bottom of the waterfalls juts out over the river and when we faced the crashing waters about 20 meters ahead of us, we felt as if the massive body of water was advancing menacingly towards us, about to devour us in its primordial violent force. The illusion felt very real and wonderfully scary. As we lifted our line of sight to the top of the waterfalls, we found a lingering rainbow, rising majestically from the clouds of incessant spray, against the densely forested hill side. We were drowned in sheer beauty. We gasped in wonder. 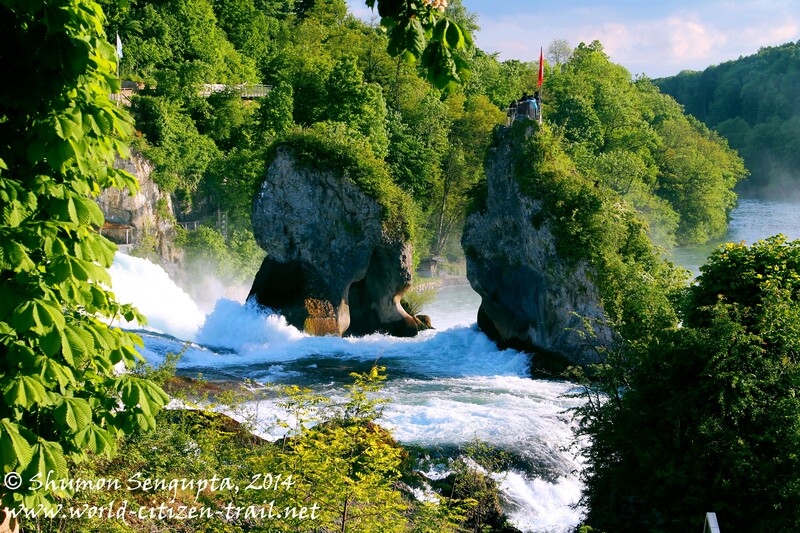 In the middle of the river, dividing the waterfalls into two parts, there was a tall rocky outcrop which could be reached by a circular boat tour. 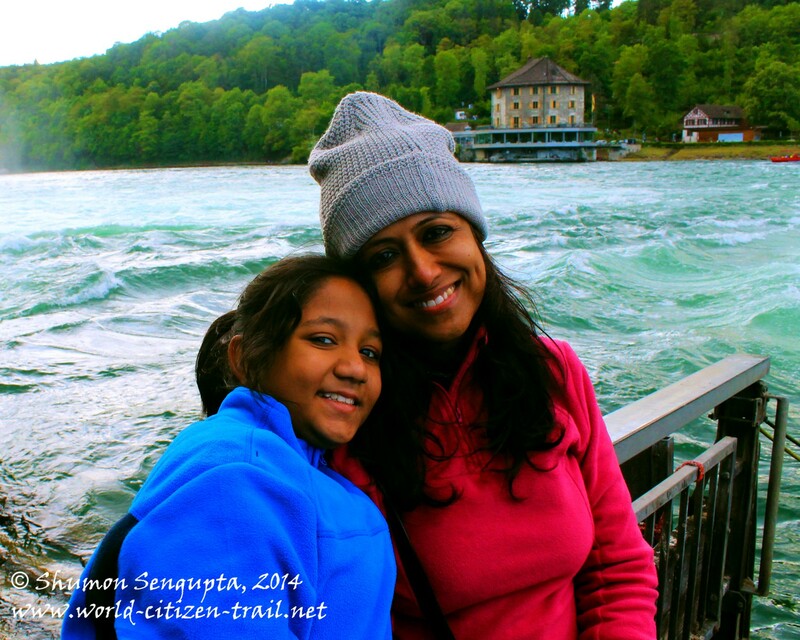 Not to miss this opportunity, we boarded the boat and found ourselves at the rock island, right in the middle of the waterfalls. Unfortunately, the place was very crowded, mainly with large groups of visitors from India and Japan and I was a surprised to note the incredibly poor management (rather the total lack of it) of this place and the fact that the Swiss took safety issues rather casually at this hugely popular site. The rocky island could hold a boatload of people and there wasn’t one, but two boatloads. The massive crowd was impatient to climb along a very steep, wet and narrow metal staircase (with room for barely two people to pass) and reach the tiny viewing platform at the top. We waited, hoping that the crowd would thin out a little, which it didn’t. Eventually, we slowly made our way to the top, along the metal stairways, feeling claustrophobic with the ceaseless rush of visitors. 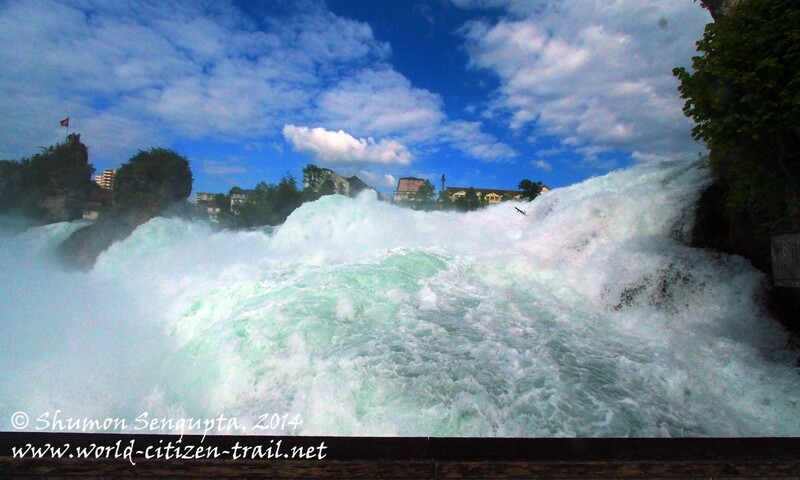 The 360 degree view from the top, virtually in the middle of the violent waterfalls, however was dizzyingly spectacular. 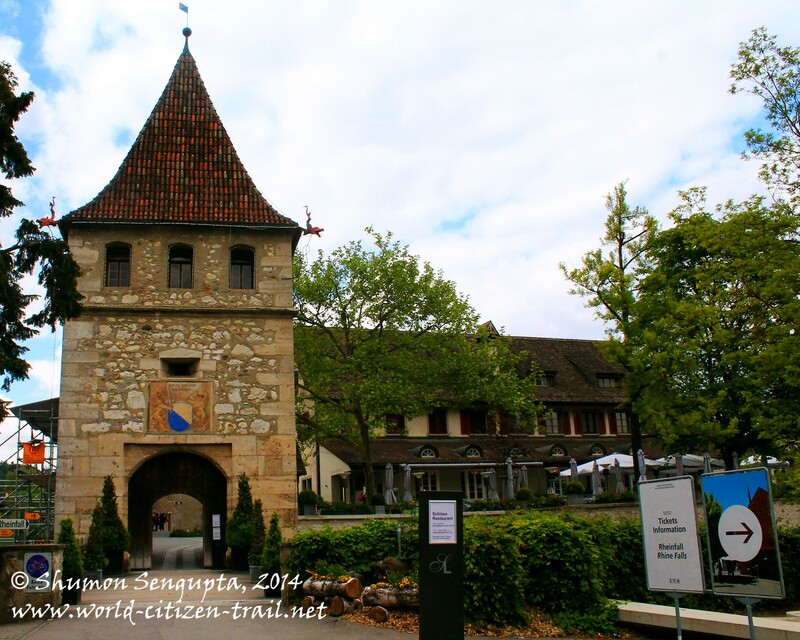 From there, we also got panoramic views of the forest clad mountains all around, including the castles of Laufen at the top of the hill on the southern side and the castle of Wörth, at the northern side, at a distance, below. We barely got a couple of minutes at the top, before giving way to the next group of eager and anxious visitors. I must say, overall, it was a rather unpleasant experience and would not recommend it. 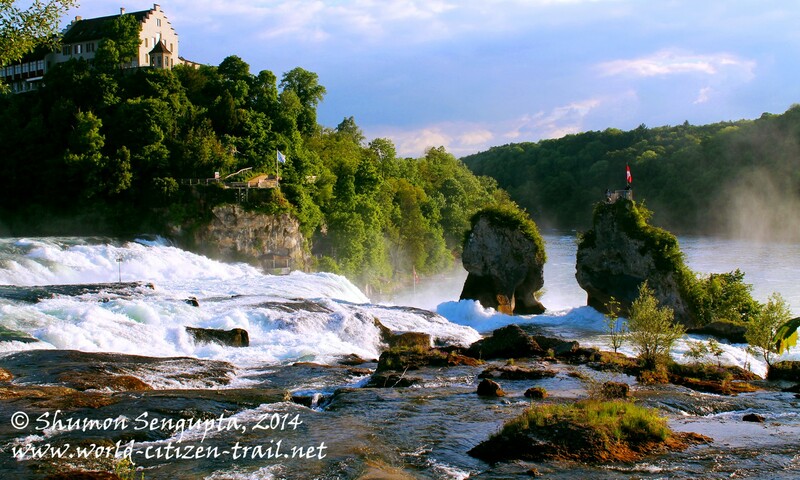 By far, the best way to enjoy these spectacular waterfalls is from the southern side in Schloss Laufen. 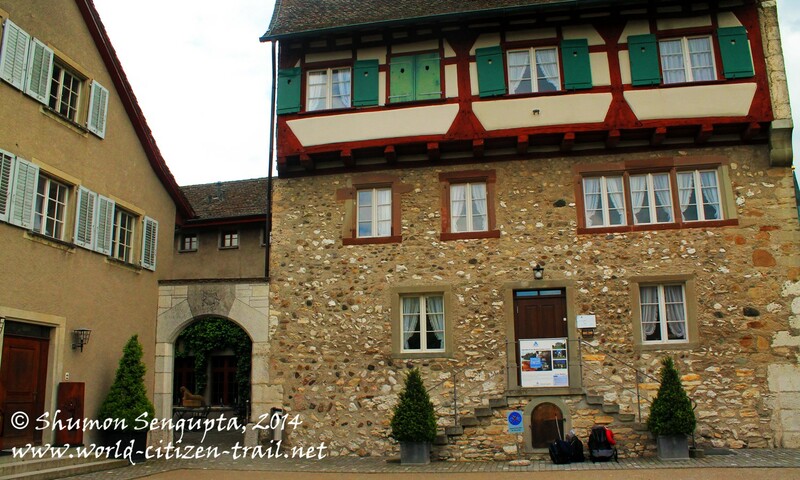 For those who have time in hand, I would recommend a night at the picturesque Dachsen Youth Hostel in the Laufen Castle. That way you get to stay at right at the top of the waterfalls and are able to experience the falls very intimately, including in the night when it is brilliantly lit up. 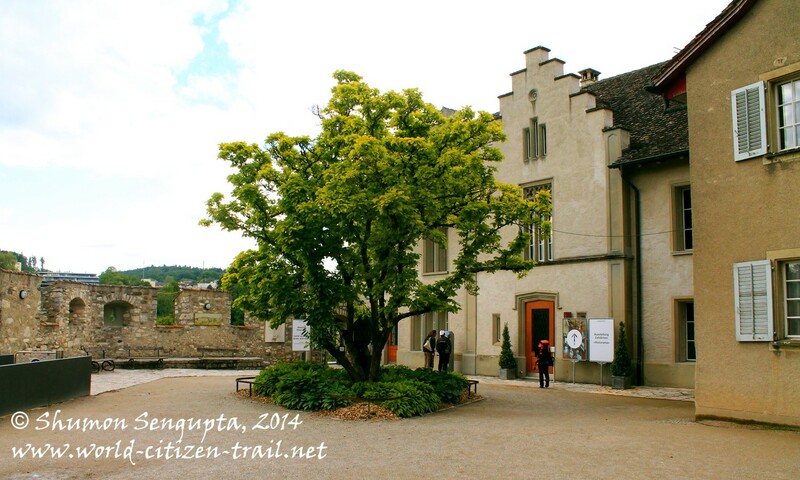 The incredibly charming youth hostel, once the wash house of the Laufen Castle, was restored in 1946 and since then it has provided a unique and exclusive experience to travelers. 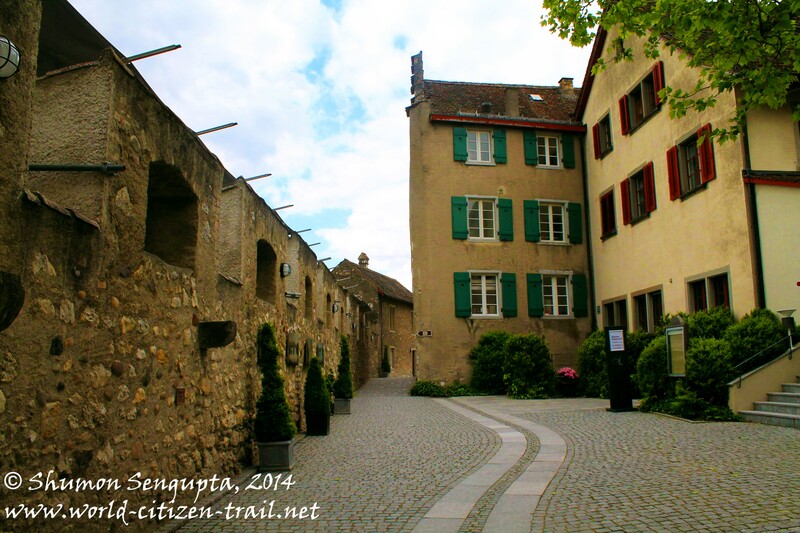 It is one of Switzerland’s historic youth hostels and we felt we were a part of history, staying a night here. Later in the night, around 10, Minnie and I walked down to the waterfalls once again from the castle. This time, the waterfalls was spectacularly lit up in a brilliant medley of lights – blue, green, turquoise, purple, red, orange. 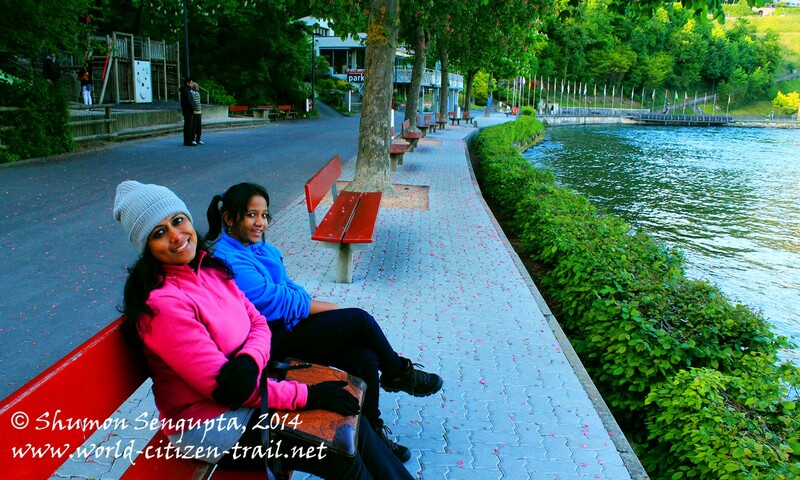 The place was deserted, save a couple of other enthusiastic visitors like us and the roar of the waters was deafening. 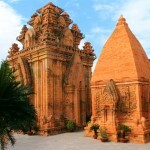 The experience was totally magical and dreamlike. 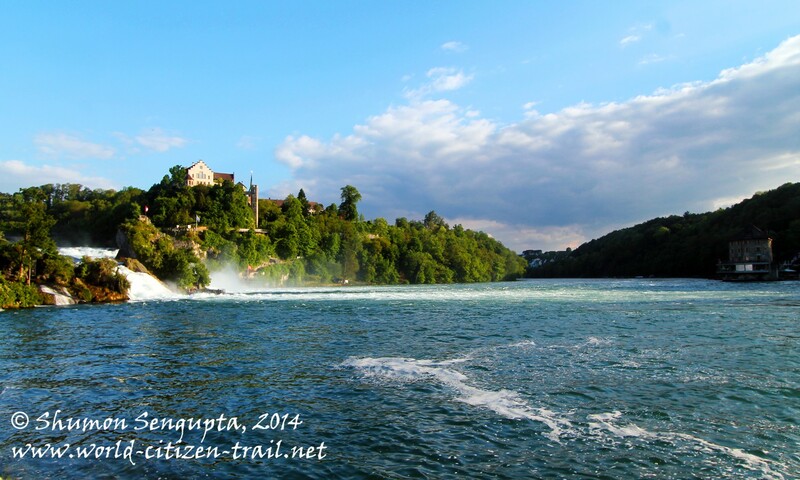 Note: Another option for reaching Schloss Laufen is to take the train from Zurich to Winterthur and then a connecting train to Schloss Laufen am Rheinfall station. 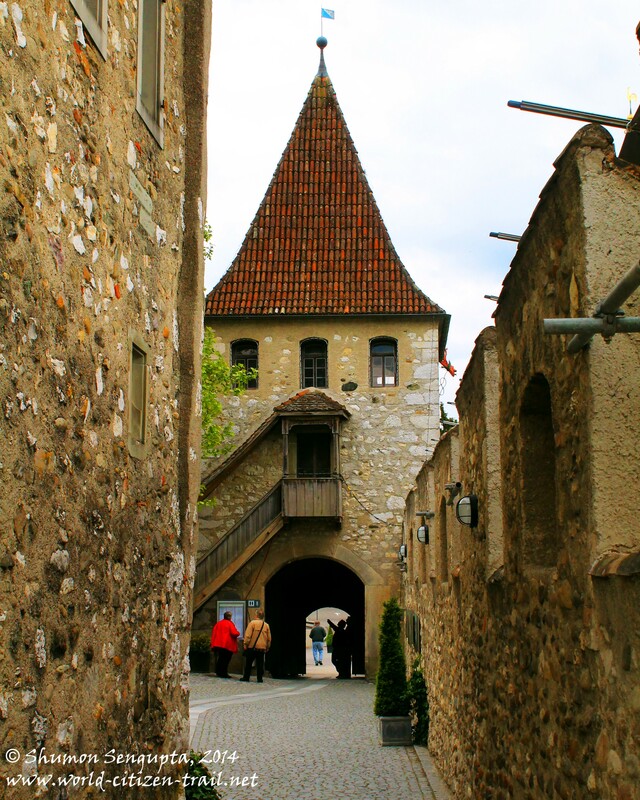 This will take you right below the Laufen Castle.